So I am doing this Review to day because of the amount of hate towards the SU-152 in the past few days. and thought I should shed some light on how some players out there can better understand, How to play this very well equipped Tank destroyer. when most players get this tank stock my recommendation is to play this tank firing HE, Only as you will find you are still going to be doing damage as if you were to fire AP you may find you will bonce a lot of shells as soon as you can get the 122mm gun things for this tank start to fall in to place. Now at tier 7 the SU-152 has the 2nd highest hit point pool with 870 Hp out of all the other tier 7 Tank destroyers. The armour on the SU-152 is only 75mm thick at the front 60mm at the sides and rear meaning you will not be able to take to many shots before you die. the best way to play this tank would be from distance the way its intended to be played. With a 600h.p engine and a top speed of 43km/h and a Reverse speed of 11km/h and a Traverse of 23, The SU-152 is by no means a slow tank but it will struggle to reach its top speed across uneven ground unlike many other Tank destroyers of the same tier. However with this kind of mobility you can move around the battlefield with ease. Well the weapon on this tank make this tank such a fearsome tank destroyer as it has a base rate of fire 8.11 rounds a min with out adding in to the effect of equipment and crew skills but when you have the 122mm with BiA, Vents, Gun rammer and even combat rations. The rate of fire is insane as I have mine down to 4.1 seconds meaning you can fire a shell every 4 seconds with an average damage of 390 this will make it have one of the best DPMs for a tier 7 Tank Destroyer, however this does come at a price you only carry 32 rounds, which can leave you running out of ammo in the longer matches. The ammo setup I use is as follows 25/6/1 I only ever carry one he shell for a reset on the cap if its down to the wire. The gun depression with the SU-152 is only -6 meaning you may have problems cresting in some areas on the maps so play with caution. The view range on the SU-152 is the lowest at only 330m meaning you need to put Binos or Optics on this tank if you want to be able to see other tanks in the distance if no one is able to spot for you. 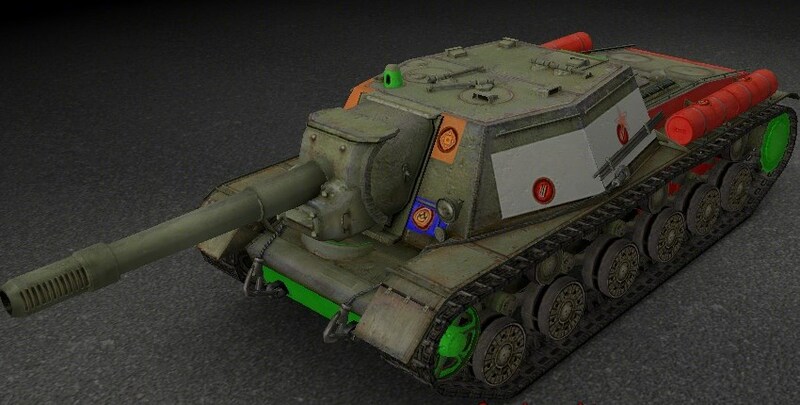 The equipment I would recommend to use with the SU-152 would be a Tank Gun Rammer, Vents and Binos as this will help your tank effectively supplies that I use and would recommend would be Large repair kit, Large First aid kit and Automatic Fire Extinguisher as the passive boosts help out your tank a lot. if you plan on keeping the SU-152 in garage with a good crew I would say to get what I have [edited]my first 5 perks Sixth sense, Brothers in Arms, Camouflage, Repairs and Clutch braking. these are the first 5 perks/skills I get for all of my Tank destroyers as I found it helps me out a lot and hope it helps you out a lot two. I take it you don't recommend the Stronk 152? So close to getting this TD, I wish WG gave it an optional package that has the 152mm gun along with the top radio, tracks, and engine. It has now. Which is a good thing indeed. Imma go derp my way all the way to the BL-10 (different tank, I know)!